1. Press together 2 crescent-roll triangles to form a square. Repeat with remaining dough. 2. Place crushed crackers in a shallow dish. 3. Top each crescent roll square with ⅓ cup chopped chicken. 4. Stir together remaining ingredients in a large bowl and scoop by heaping teaspoonfuls onto chicken. 5. Fold and pinch edges together. Roll each chicken puff in the cracker crumbs. Place puffs on a greased cookie sheet in freezer for 1 hour. Then place chicken puffs in a one gallon freezer bag and freeze. 1. 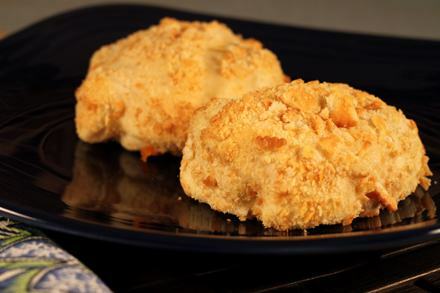 Place frozen chicken puffs on greased cookie cheese and bake at 350°F for 20 to 30 minutes or until golden brown.